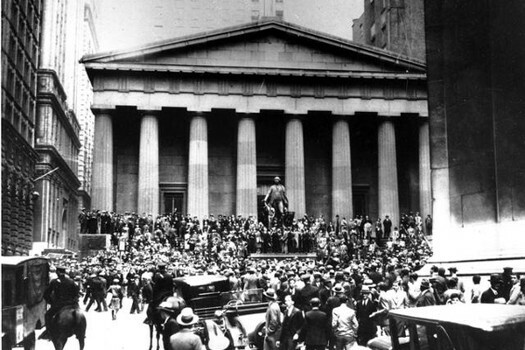 Above, Wall Street at the time of the 1929 crash. Quite some time ago, I wrote a novel. It was long – very long. It is like so many novels written; unpublished. It was printed out on many many sides of A4 and put into two lever arch files. At the time, my father, now deceased, had very poor eyesight can was registered as blind. As a result I read the book to him. He liked it. And that is all that matters. One of the characters was a crooked so and so who ended up very rich. He was a man or humble origins who made his fortune through insider dealing – which in 1920s America was not a crime. The phrase, “Clocks work on future time on the Street” was used by this character to explain to another character the way the stock market worked – that the price of a stock took into account expected future events. These could send the price of the stock up or down depending on the anticipated event. This of course explains why the US politicians made insider dealing a crime! Today, the excellent Dr. North offers a possible set of reasons why Madame Mayhem is doing what she is doing. He describes what another fictional character – Captain Edmund Blackadder – would describe as “a cunning plan”. It FAILS to take into account the actions of others. This organ for some time now has pointed out that IF Madame pursues a strategy of driving the UK over an economic cliff, other parties, notably institutional investors across the world and the creditors of the UK – of which there are many – will take fright! At some point in the 163 days or 5 months, 12 days between Thursday 18th October 2018 and Friday 29th March 2019 the markets (stock and currency) will take fright and react. Severely! At this point, many British politicians will take fright and this fright will motivate them to try and prevent this disaster. Accordingly, expect a second referendum Dear Reader!